Happy Nutrition Month! In case you haven’t heard, March is Nutrition Month and Registered Dietitians actually get an entire “Dietitian’s Day” devoted to their profession on March 20th – YAY! So let’s celebrate! Instead of writing a more traditional “Nutrition Month” blog, which focuses on a healthy eating theme, I thought it might be more interesting to write about some of my reflections on actually being a Dietitian. If you would like to read more about this year’s Nutrition Month themes, you can do so here. Over the past 13 years, I’ve had the pleasure of working as a Registered Dietitian (RD). When I first started my university undergraduate degree in Nutritional Sciences, I actually knew very little about what RDs did. As I progressed in my studies and had more opportunities to shadow and work with RDs, I grew to understand some of the various roles they had, the clinical knowledge they possessed in order to provide high quality nutrition care, and the vital role they played as part of the health care team. When I started my internship and Master’s program, I was especially fascinated with the clinical role of the RD, which led me to my first job in a large teaching hospital. While there were many interesting cases, and great opportunities to use my clinical skills, I soon realized that I was most passionate about educating and building relationships in order to help clients and patients achieve their health-related goals. This led me to work as an outpatient RD for the past 12 years. I love that my job has allowed me to work with people every day; educating and empowering them to make changes to their relationship with food. The science nerd in me also continues to be amazed by the human body and how it interacts with nutrients and compounds in foods. We are still discovering so much in the field of nutritional sciences, and that makes our jobs as dietitians both interesting and challenging. I feel lucky and honoured to be part of a field that is so fascinating and always evolving. That being said, I’ve also experienced some challenges that are likely unique to a career as an RD…some can be comical; others a little more serious. ... and we eat this too! In any given social situation, it goes without saying that someone will ask what you do, and as soon as you reply with “I’m a dietitian”, they immediately make comments about a) what they’re currently eating or drinking b) what you’re currently eating or drinking or c) both of the above. It must be some DNA-encoded trait because it happens Every. Single. Time. While I find it kind of funny (and sometimes a tad annoying), I get it – perhaps people feel some sort of shame or guilt when they realize they’re in the company of a dietitian while polishing off their third beer and eating a plate full of nachos or cake or whatever the case may be. Or perhaps they feel some sort of fascination realizing that the dietitian is also eating said nachos and enjoying a bevy or two. But whatever the case is, realize this, many of us are dietitians because we love food. For some of us, our job is literally to talk about food all day. Yes, we likely tend to eat healthier diets than the average person because most of us also really like healthy food, but we also like to enjoy foods that taste good and that bring people together. We are most definitely not tracking every single thing we put into our mouths. And we’re also most definitely not tracking every single thing you put into yours. This one is tough and something that I’ve observed and struggled with for a while. I don’t understand why people think it’s ok to comment on the shape/size/weight of a health professional (namely, an RD). It’s not ok. I know most people are probably making these comments thinking they are complimentary (“You obviously practice what you preach” or “You just got back from maternity leave? You don’t even look like you had a baby!”). While they may be well-meaning, it’s completely inappropriate to make these comments to your dietitian for several reasons. While I realize that people likely want to take nutrition advice from someone who is also living a healthy life, the size/shape/weight of their body does not have anything to do with how healthy they are. And it’s about time that dietitians stop being judged on the size of their body or how they look to determine how “good” of a dietitian they are. Body weight is mostly determined by genetics and health comes in a wide range of sizes. If this concept is new to you, we’d love to chat about it further! But in the meantime, please refrain from making comments on what dietitians look like. It’s frustrating, demeaning, and undermines our education, knowledge, and credentials as health professionals. While we realize that the societal “thin equals healthy” paradigm has been indoctrinated in us for many, many years (and that’s a whole other topic! ), it’s time to start realizing that RDs do not have to look a certain way. Where are YOU getting your nutrition information from? If you follow us on Instagram, you may have seen an IG story that Rosanne did a few weeks back about how people will seek out nutrition advice from a plethora of unreliable sources before they seek out advice from an RD. 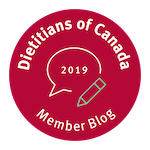 Research has shown that Canadians will go to Google (not surprising), family and friends, social media, and TV programs before seeking out a dietitian… we’re 5th or 6th on the list. It’s hard for us to swallow that Gwenyth Paltrow and J-Lo have the upper hand! I’m not sure why that is exactly, but it can definitely be a challenging part of this profession. RDs are university educated, many of us have Masters degrees, we all have to complete a 1 year internship program in addition to an undergraduate degree in Nutritional Sciences, and yet somehow, we are not seen as being the first-line go-to for nutrition advice or counseling. Let’s change this! We are happy to help you with all your nutrition questions and concerns. Our passion is providing evidence-based education and working with you to make lifelong changes that will help you achieve your goals, whatever they may be. Despite some of the more challenging aspects of the profession, we have a passion for nutrition and the profession of dietetics. We are lifelong learners, lovers of science, passionate about helping and empowering our clients, and focused on building relationships to truly find out what matters most to you. We are honoured to be part of your health journey. We are also honoured to work among so many smart, super-star, inspiring RD colleagues. If you are looking for credible nutrition information, please seek out RDs – follow them on social media, book an appointment to see one, and appreciate all they do in an age where nutrition information (and misinformation) is rampant. So let’s raise a glass of whatever beverage you enjoy, eat some delicious food, and cheers to Nutrition Month and all the hard working RDs that make it possible!